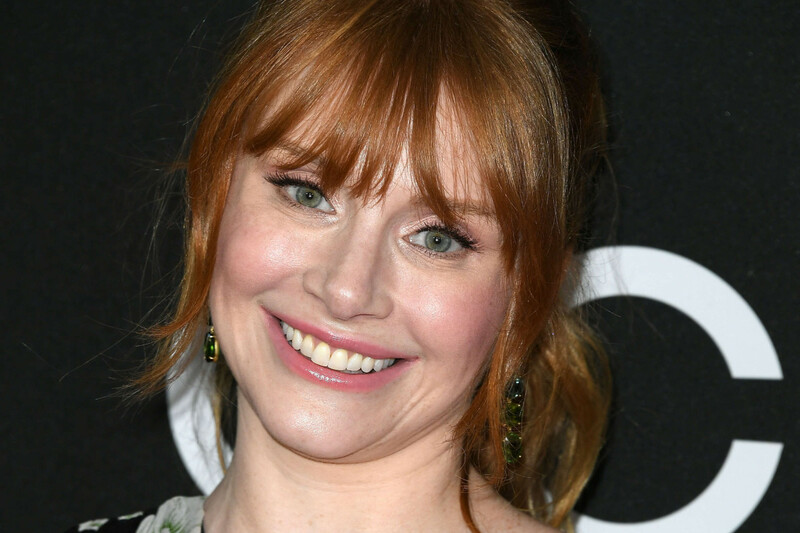 Unlike, say, Kim Kardashian or Renée Zellweger, Bryce Dallas Howard isn&apos;t the first celebrity that comes to mind when you think "I want to see her Before & After!" In fact, I just assumed—with her natural red hair and delicate bone structure—that she&apos;d always looked this way. Well, not exactly. The 35-year-old actress has not only experimented with some dramatic hair changes over the years, but she also may have gone under the knife. Bryce Dallas Howard at the 2003 premiere of &apos;Tartuffe&apos;. Kicking things off is Bryce at age 22, and it looks like—by Hollywood standards—she was late to the nose job party. Not that I think she "needed" to have it done... it&apos;s the baby bangs and harsh eyeliner I have more of a problem with. Ha! Bryce Dallas Howard at the 2004 Stella by Starlight Gala. The following year, Bryce looked far more grown up. The shorter, shaggier hair with a darker hue makes her look more mature than her 23 years. The makeup is better, with her waterlining technique much improved. Her nose is definitely wider than it appears today. Bryce Dallas Howard at the 2005 premiere of &apos;Constantine&apos;. Now the haircut has morphed into a &apos;00s interpretation of "The Rachel." Bryce also lightened up her makeup palette; these soft, sheer, peachy shades look great on her. Bryce Dallas Howard at a Nina Ricci show in 2006. Surprise! For a hot minute in 2006, Bryce went blonde—but only for her role in Spider-Man 3. I think we can all agree it&apos;s not as good as the red, and washes out her skin tone. It all looks very Holly Madison. Plus, I&apos;ll never be a fan of cut-crease eyeshadow. She still had the wider nose here. Bryce Dallas Howard at the 2007 New York premiere of &apos;Spider-Man 3&apos;. The following year, it was back to auburn, and in case you&apos;re wondering, Bryce was pregnant here. Immediately, her skin looks more glowy and fresh... amazing how hair colour can do that, huh? I love the side-swept bangs and sheer pink blush and lip gloss. Bryce Dallas Howard at the 2008 New York premiere of &apos;The Loss of a Teardrop Diamond&apos;. Surprise number two! In 2008, at age 27, Bryce ditched the red hair completely and sported this dark brunette shade, along with brow-skimming bangs and long waves. I&apos;m also sensing a possible change in the shape of her nose by this point; the bridge looks narrower. Bryce Dallas Howard at the 2009 Paris premiere of &apos;Terminator Salvation&apos;. And now Bryce started to look a lot more polished—such is the power of an A-list beauty team! A redhead once again, she accentuated her colouring (instead of fighting it) with a bold red lip, much softer eye makeup, and no blush. Besides her new nose, her lips look fuller here, although that may just be over-lining. 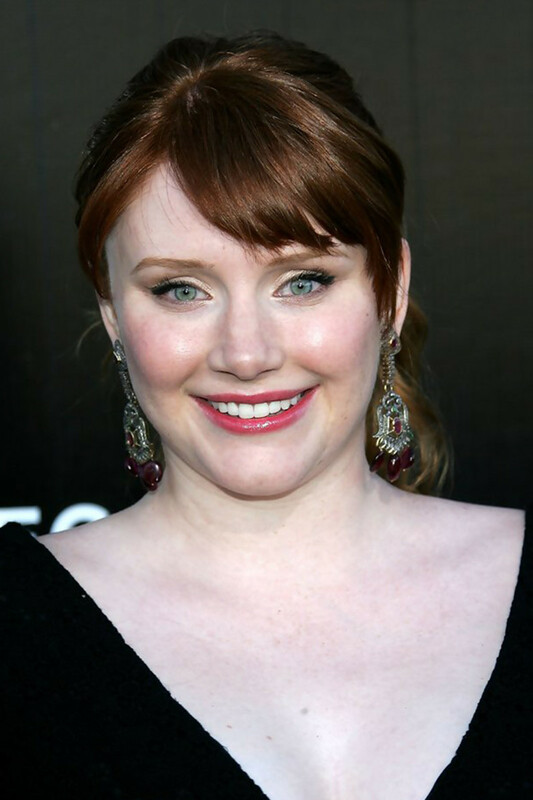 Bryce Dallas Howard at the 2010 Hollywood Awards Gala. Bryce kept the auburn hair in 2010; her colour is incredibly fresh, shiny and vibrant. I love how it makes her skin pop, although perhaps she dusted on a tad too much blush. Since she&apos;s smiling here, her nostrils look wider, but notice how the tip looks refined. Bryce Dallas Howard at the 2011 Toronto premiere of &apos;Restless&apos;. By 2011, Bryce was 30 years old. I just love this shot—the slightly fuzzy waves, visible freckles and seemingly foundation-free skin are so pretty (and a nice change of pace from the usual red carpet heaviness). She also amped up her red to an even brighter hue, and threw on a pair of false lashes; surprisingly, I like both! Her nose looks extra-petite here. Bryce Dallas Howard at the 2013 premiere of &apos;Jobs&apos;. Then, in 2013, it was back to dark auburn—and a paler skin look as a result. The electric pink lipstick is really fun, but I prefer Bryce as a strawberry blonde with softer makeup. Bryce Dallas Howard at the 2014 Variety Power of Women event. Another year, another major hair change. This time, Bryce chopped it off into a long bob, worn straight, with choppy, lash-skimming bangs. I think the lined eyes and red lipstick make this look a bit "intense" and angular. Bryce Dallas Howard at a 2015 Samsung Galaxy launch. I&apos;m glad Bryce softened things up in 2015. The strawberry blonde is my absolute favourite hair colour for her; I also love the soft, glam waves. Makeup is her most sophisticated ever: pinky-brown to sculpt the eyes, with peachy lips and cheeks, and chunky black mascara. I do wonder if she might&apos;ve started with a little Restylane in her lips and cheeks by now—her mouth is more pouty, and her face definitely seems wider around eye level. And that brings us to 2016! Bryce is 35 now, and (in my opinion) more gorgeous than ever. The newness this year is the fringe, worn here with big, brushed out waves. I love the shimmery smoky eyes (although maybe not the falsies) and muted pink blush and lipstick. Again, her nose is super-narrow compared to where we started off... and I think her lips and cheeks do look fuller. 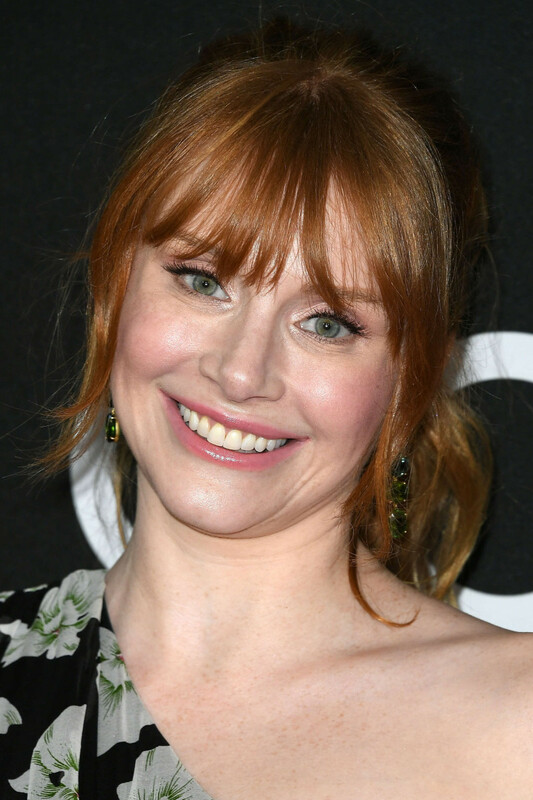 Bryce Dallas Howard at the 2017 Hollywood Film Awards. This is the most natural and relaxed we&apos;ve seen Bryce look in a long time! She&apos;s now 36, and appears to have gained a bit of weight in her face, which softens her features. I definitely think she still has filler in her cheeks and upper lip, but it&apos;s subtle and tastefully done. 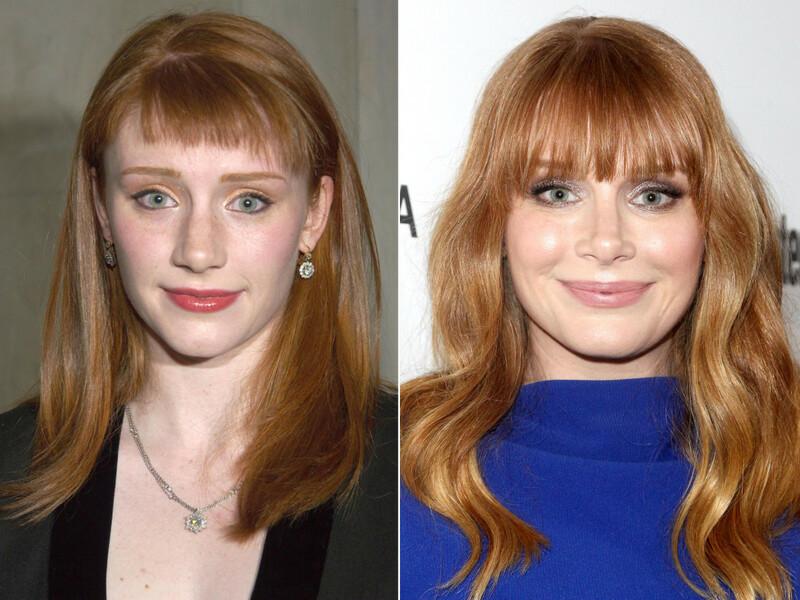 Bryce Dallas Howard in 2003 (left) and in 2016 (right). Clearly, Bryce is adorable—but there&apos;s no doubt, like her Hollywood peers, she had the help of a great beauty team and great surgeon. Here&apos;s what the pros have to say. "It looks like she&apos;s had a rhinoplasty," Dr. Michelle Copeland, a New York plastic surgeon, told Life & Style. "Bryce&apos;s nose is thinner and the tip is more refined. Her lips look fuller, suggesting a filler such as Juvéderm or Restylane." "Filler in the apples of her cheeks has given her a beautiful facial shape," says dermatologist David E. Bank. "It has widened her face at the cheekbones, giving her a youthful appearance. Bryce [also] appears to have had Botox, which has opened and brightened her eyes and kept her forehead smooth." How do you feel about Bryce&apos;s beauty evolution?